Information acquired as a result of a public records request Pegasus Equine Guardian Association submitted to Texas State University has uncovered that federal grant money is being paid to Jacob Thompson Cattle LLC, also known as Thompson Horse Lot & Co. by Texas State University. ​Based on the info we received from TSU the $80k+ grant money is to cover costs for roundups of 70-210 horses over the course of as many as 7 roundup “events”, with in the date range 9/30/17-9/29/18. This might mean they will request more grant money after Oct 2018. Texas State University who was awarded 1.75 mil by Army Corps of Engineers. The Thompson Kill pen located in Pitkin, LA is approximately 15 minutes diving distance from the south / east gates of Fort Polk. This organization and its agents are known for their questionable business practices and cruel treatment of horses. Currently what we are witnessing is literally the annihilation of a herd that has ranged on these lands for over a century. While there have been dumped horses, the vast majority are wild horses that have thrived in this area for a very long time. Words cannot describe the disgust I feel with the way the Army and TSU has chosen to handle this. 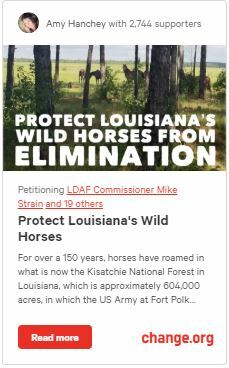 The course of action currently in motion, the frequency, and the way the USARMY and TSU are carrying it out, could set a dangerous catastrophic precedent for wild and domestic horses for years and decades to come. The horses should be protected and their long-term welfare considered regardless if they have been abandoned, if they are generationally wild or otherwise wild, their welfare is at stake. As we have seen the requirements for an organization allowed to handle these animals are of the lowest standard. Considering the collaboration with Jacob Thompson and agents of the Thompson Kill Pen in Pitkin, LA who are known for their questionable business practices and cruel treatment of horses. To make matters worse, there is a significant amount of controversy surrounding the current 501c3 selected by the Army, Meridian Falls Ranch, who have denied collaborative help from local individuals whose only goal is to to see these horses find a safe place to land, which is absurd knowing the struggle to place well trained horses in our society much less wild horses. This lack of collaboration to ensure the best possible outcome for horses evicted encouraged people to look a little deeper into Meridian Falls track record, and what has been found is extremely worrisome. A little research has shown that there have been some serious allegations to one of board members/president not to mention a conviction on “cruelty to livestock animals” in 2016 and an arrest for “Abandon Endanger Child Criminal Negligence” on 10/22/2017. The concern is Meridian Falls Ranch will resort to inhumane disposal of the horses. So what we have covered is that federal grant money is being used to fund criminals with Livestock associated convictions to handle these precious horses and a complete disregard for their long term welfare. This is a travesty and as an American citizen and a lifelong resident of Louisiana I am appalled. Next Post Help Needed: Fort Polk Horses Need a Home! I’m beyond disgusted. All the lies after LIES. This country/ government is for the slaughter of horses. That’s all we r now… Anything moves breaths kill it. Starting to think the sooner every living animal in this world is dead the better. Their suffering will be over. Then all u fuckers can be ever so proud. I’ve been a neighbor to the Thompson family for 42 years I’ve watched them Con and still My whole life ! I’ve traveled throughout the United States And anytime the Thompson name was mentioned concerning livestock people usually run backwards ! They’ve all been crooked since the day they was born and they’ll be crooked till the day they die ! Just common knowledge in these parts . Biggest. Crooks ever make million on killing. Horses. And the government wants to give them more money.Stupid heartless crooks. This is a total disgrace and giving tax payers hard earned money to people who have been convicted of animal cruelty is wrong. I can’t believe this that a University is paying a kill lot this much money for horses!!! WHAT does the State of Texas have to do with this and why is Thompson Horse lot lying to people about how much they love these horses and want to place them in homes and then THIS!!! IT’S NOT ABOUT THE HORSES IT’S ALWAYS BEEN ABOUT THE MONEY!!! THEY DON’T CARE ABOUT PEOPLE OR HORSES. All about the money is right but it goes deeper than that. when it comes to the money you’re looking at politics when you have a state representative hands in a contract mowing some of the larger drop zones at Fort Polk million dollar contracts that only get cut twice a year. why so little? because the horses keep it eat down so it’s easier to manage but yet get rid of the horses and you got a bigger mowing contract ! And the same state representative had a subcontract to build! the horse corrals to catch the horses in the first place so yes it’s all about the money.